To finish off a weekend of strikes which coincided with the Sundance Film Festival, Sunday saw a group of strike supporters protest at the Picturehouse cinema in Soho, London. Despite the peaceful nature of the demonstration, management and a team of security guards responded with violence and intimidation. Although thankfully no one was arrested, a protester was detained inside the cinema for over half an hour. Arriving at approximately 5:30pm, protesters entered the cinema and explained the nature of the ongoing dispute before breaking out into chants and distributing flyers to customers. Since the living wage dispute started in 2016, Picturehouse has ensured to always keep a team of security guards on hand at all affected cinemas. Security staff don't receive the living wage either, but that didn't stop them from roughing up the peaceful protesters. Individuals were grabbed and thrown out the doors. Those who went limp were dragged out. Predictably, this shocked customers, some of whom took out mobile phones to record the scene. Others just left in disgust. Once outside, protesters continued chanting while flyering the public. Security's heavy-handed response continued, physically shoving individuals who were near the door. At one point, a protester attempted to open the cinema door and a security guard proceeded to punch their hand, crushing it between the guard's fist and the metal door. After some time, the protesters decided to re-enter the cinema. This time Picturehouse upped the violence. The first person to enter the cinema was physically tackled and detained. Subsequent protesters were aggressively forced out the door by a team of heavies. The detained protester, surrounded by no less than three security guards at any time, was physically pinned down for close to ten minutes. The doors to the cinema were locked and as a line of customers formed, a steady stream of passersby stopped to find out what the commotion was all about. Inside, management was desperate to hide the unfolding scene. Security guards sought to obstruct the view of the protesters, a number of whom were filming the incident through the plate glass windows on the front of the cinema. After nearly half an hour, the police arrived. Presumably, management had hoped to see the protester arrested, especially as their choice to detain him proved the most obstructive element of the day’s actions. Ultimately, the protester was let off with nothing more than an admonishment not to return to the cinema for 48 hours. 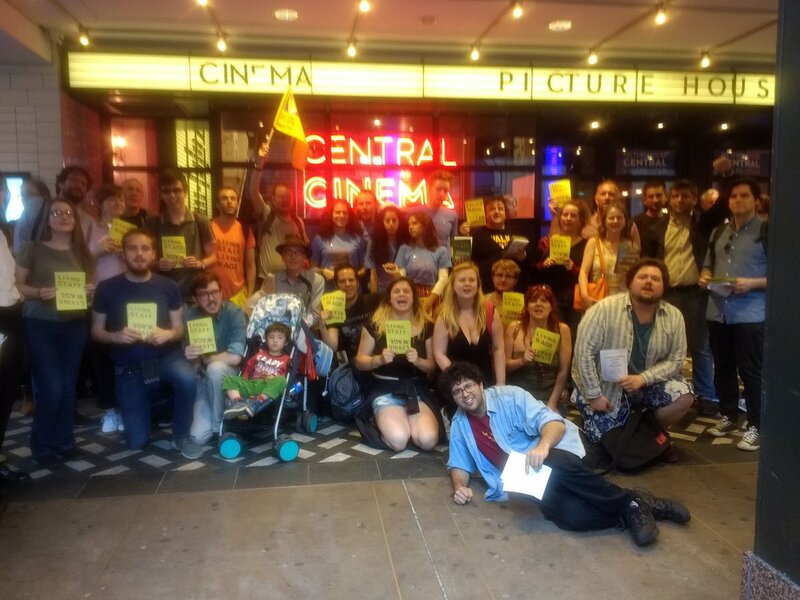 Workers at the Picturehouse cinema chain have been fighting for the living wage for the past year and half. Despite the fact that Cineworld, the owner of Picturehouse, made roughly £120 million post tax profit in 2017 and whose board voted to raise the pay package of CEO Mooky Greidinger to £3 million, management has refused to negotiate. Instead, the company has responded with threats and the systematic sacking of union reps. The campaign has seen a series of high profile strikes, public actions, and the creation of a support group to organise protests and pickets in support of the workers' demands. This has proved a potent combination and Picturehouse's actions this weekend only serves to show the fear management has of a well-organised workforce backed-up by militant and uncompromising outside support. The irony is that Picturehouse market themselves as this artsy independent chain, taking pride in showing alternative, progressive, lefty films that centre around social justice.